You can hear the ringmaster’s voice saying “Step right up, step right up. This way to the fabulous Circus of Life. Come one, come all, and see the most amazing sights in the universe. And the most amazing thing of all is that entrance is free. That’s right folks, you don’t pay a cent to get in. You pay to get out, but the cost of that is up to you. 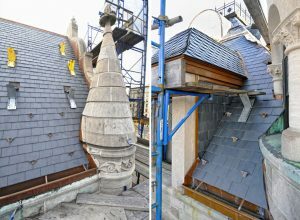 So step this way.” Next time you are in Harlem, New York “step right up to” 10 St. Nicholas Place and check out the new Canadian unfading black slate roof on the restored James A Bailey House! 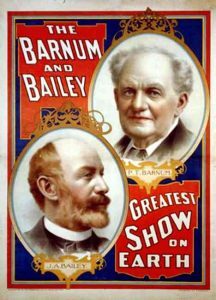 Known as “the house the circus built”, the James Bailey House was built between 1886 to 1888 for circus impresario James Anthony Bailey of the Barnum & Bailey Circus. 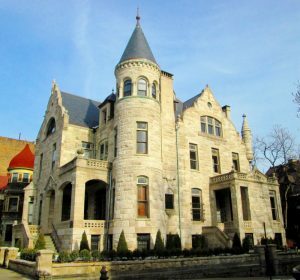 This gorgeous 10,000 square feet Romanesque Revival house has the appearance of a castle with its limestone exterior, nine bedrooms, porches, stained glass windows, balconies, corner turret, complicated slate roof and Flemish inspired gables. In 1951, the house was sold to Marguerite Blake, who ran a funeral home from the basement. In 1974 the house was designated a New York City Landmark and in 1980 was added to the National Register of Historic Places. In 2008, Ms. Blake put the house up for sale and listed it at $10 million. The house made the news when it was sold in 2009 for 75 percent less its listed price for $1.4 million. 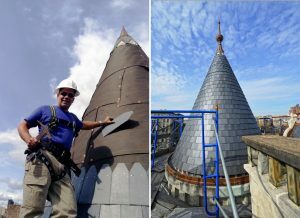 In 2014, this New York treasured building underwent a major restoration. The North Country Unfading Black roofing slate tiles was a perfect match of the old slate on the roof. We supplied a 16” x 9” x 3/16” slate tile which is lighter than standard ¼” thickness and weighs 650-800 Lbs per square. 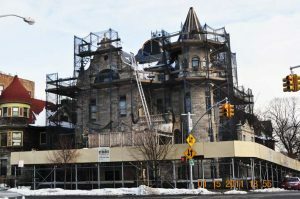 The new slate roof will protect this house for another 100 years and the house will remind the Harlem community of their rich past and history. That ends our story of the grand restoration of the James Bailey House “ladeez and gennelmen, boys and girls”.